Kunming is also called Spring City, because of its mild weather all year round. It attracts visitors with so many places of interest spread all around the city and the beautiful and peculiar natural landscape. This 3-day private itinerary will take you to visit all the major attractions from the dramatic Yunnan Stone Forest to the local bustling street. 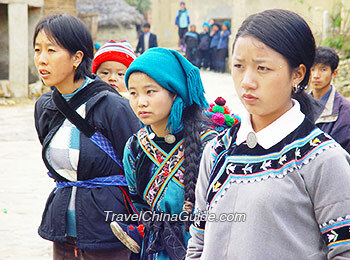 Minorities in Yunnan have long illustrious history intriguing to people home and abroad. Join this private Yunnan tour with extension to Vietnam, you will be indulged in the amazing countryside landscape in Jianshui, the delicate Terraced Fields in Yuanyang and Sapa as well as the breathtaking scenery along Halong Bay. You may find it not hard to fall in love with China and Vietnam. Along this route, you will have a chance to witness the most marvelous natural scenery and distinctive human landscape of Kunming and Lijiang, including Stone Forest, First Bend of Yangtze River, Tiger Leaping Gorge, Lijiang Old City, and the Baisha Murals. This tour will take you to admire the splendid works of nature in Kunming and explore the mysterious Tibetan Buddhism in Shangri-La. 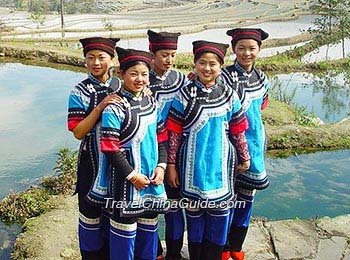 You will also fully experience the custom of the minority people in the old village. Follow us to marvel at the Stone Forest - the landmark of Kunming and the famous sight of the lake's reflection of Three Pagodas in Dali. 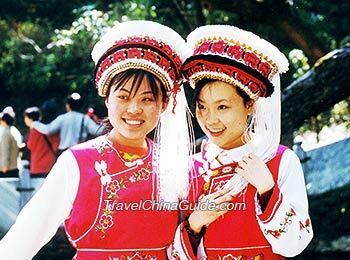 Apart from that, the visit to Dali Ancient City and minority villages are also the focuses of this tour. 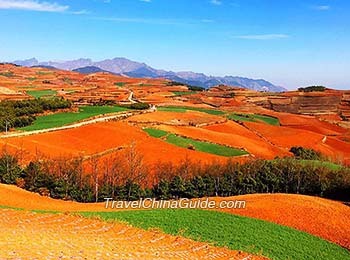 Rice terraces of Dongchuan Red Land, resembling colored ribbons waving on hillside, is regarded the paradise for shutterbugs. Take this itinerary to capture the splendid scenery with your camera. Besides, the Stone Forest and karst landscape at Jiuxiang Scenic area won't disappoint you either. This itinerary will lead you to take in the natural wonders of Kunming, like Stone Forest and the karst caves of Jiuxiang Scenic Area, and make you soak up the ethnic atmosphere of Yi minority at Chengzi Ancient Village. 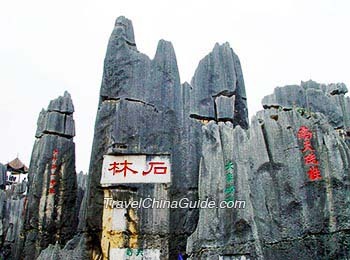 Have a day trip to the Stone Forest - the symbolic attraction of Kunming City, as well as the Western Hills in suburb, from which you can have a full view of the city and vast Erhai Lake. 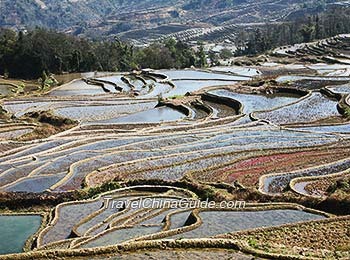 Located in the south of Yunnan province, Yuanyang is widely well-known by the world with its strong ethnic flavor and spectacular terraced fields. 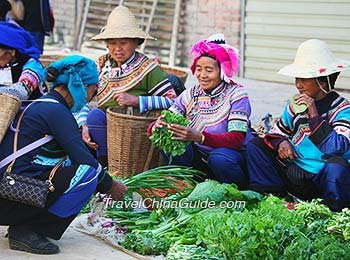 This independent travel itinerary is suitable not only for the photography enthusiasts, but also for travelers who would like to experience diverse local ethnic culture. Apart from the well-known Stone Forest, Yunnan contains more than a hundred extinct oryctocoenose fossils. This attraction may stir your great curiosity and interest. Moreover, Fuxian Lake is the best resort near Kunming. 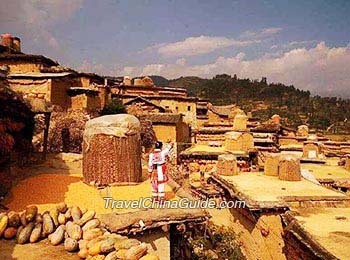 After a tour in Kunming, you will visit Yuanmou County to appreciate local two famous sightseeing spots: the Yuanmou Man Archeological Site and the Clay Forests. Taking tours around the frontier will make you feel quite special. This trip let you to visit South Lake in Mengzi County, with your first exploration to Yuanshi Cave. Daweishan Nature Preserve Area and Vietnam Street will be arranged for your second day. The splendid Dadieshui Waterfall Scenery Zone and the graceful ancient A-Lu Cave nearby make this ecological tour itinerary exceptionally colorful. For more tours, please click Hiking Adventure, Golf Vacation Package and Bicycle Routes. DAY 1 : I will arrive Kunming at 1pm and i have gap before i move to Lijiang by train at 9pm where should i travel in Kunming? 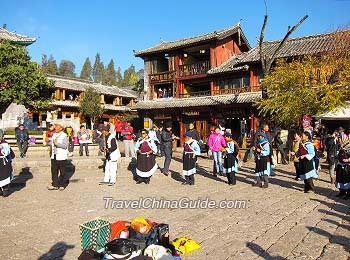 DAY 2 : I will arrive Lijiang at 5.30 AM and i plan to visit at Jade Dragon snow mountain. Do you know howmuch time that i need to spend with this? And if i still have time at evening where should i go? DAY 3 :I plan to move from Lijiang to Dali at 5 pm. 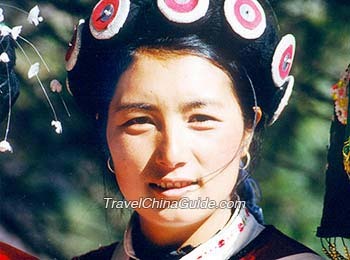 where should i travel in Lijiang before i move? 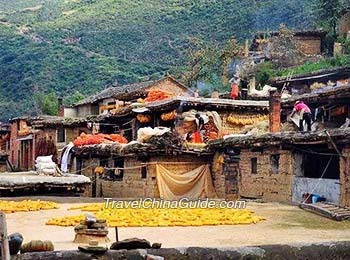 When i arrive dali i will go to Dali Ancient City. DAY 4 : I have to move back to Kunming at 2 PM . Where should i go in the morning ? Could you please suggest me some local markets that open in the evening or morning and near the city? On the first day afternoon, you can go to Green Lake Park, the most beautiful park in Kunming, which is called "the beautiful jade in the city".The park is open for free, with tens of thousands of red-billed gulls from the north wintering on the lake in winter. The streets around the park are lined with featured shops. 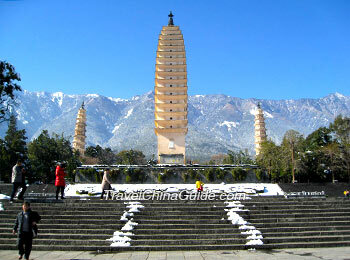 The second day to climb the Jade Dragon Snow Mountain, it is generally takes about one day to visit. During the peak travel season, it will take a lot of time to wait in line for the cable car. Usually, tourists will go down the mountain at about 5:00 PM. You can choose to stay in the inns around Shuhe Ancient Town in the evening after you go down the mountain and stroll around there in the evening.On the morning of the third day, you can go to Heilongtan lake park, 6 kilometers away from Shuhe Ancient Town, or walk around Lijiang Old Town, but pay attention to the time of going to Dali in the afternoon. 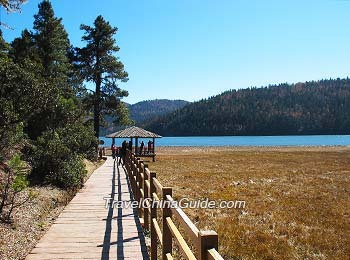 You can go to Erhai lake on the morning of the fourth day.This is just my personal advice, because Yunnan province has many beautiful tourist attractions, you can also ask the hotel or inn where you stay to give you reasonable travel advice. Which season best visit Kunming? Known as ‘the City of Eternal Spring’, Kunming is suitable for visiting all year round. The best time is from March to October when you will enjoy not only the stunning natural landscape, but also the fascinating minority cultures. There is no direct bus from stone forest to Jiuxiang Karst cave, but you can connect a bus at Yiliang Bus Passenger Station. Can I get to Upland International Youth Hostel from Kunming Airport by metro line 6? No, metro line 6 can’t take you directly there. You need to change to line 3 at East Coach Station, and get off at Wuyi Rd. After that, take a taxi to your hotel, which takes about 5 minutes and CNY10 or so. Do the above schedule sequential and workable. Is it ok to avoid Dali? Or can be accomodated in the above plan? Thanks in advance. Day 4: Luoxiaguan ??? where is it?